On April 14th at Chilbolton, the base concrete was poured for the LOFAR RF-container. The container is a box which will house most of the LOFAR electronics located at Chilbolton and is used to digitise the data, break it up into separate spectral channels and then transmit it first to the main site building and then on to the Netherlands for processing. All the signal cables from the antennas in the field will feed into the container. 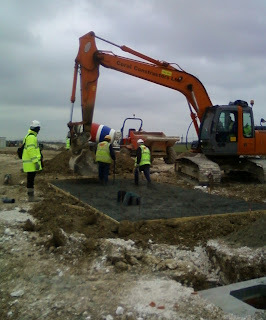 They enter through tubes that go under - and then rise up through - the concrete pad. 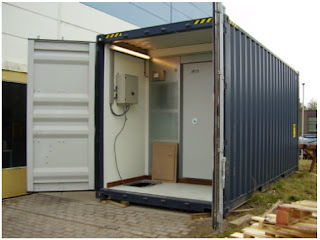 The container itself is called an RF-container, because it is shielded against RF (radio frequencies). Electronics emit significantly at the very frequecies we want LOFAR to detect, so shielding them from the antennas is very important.